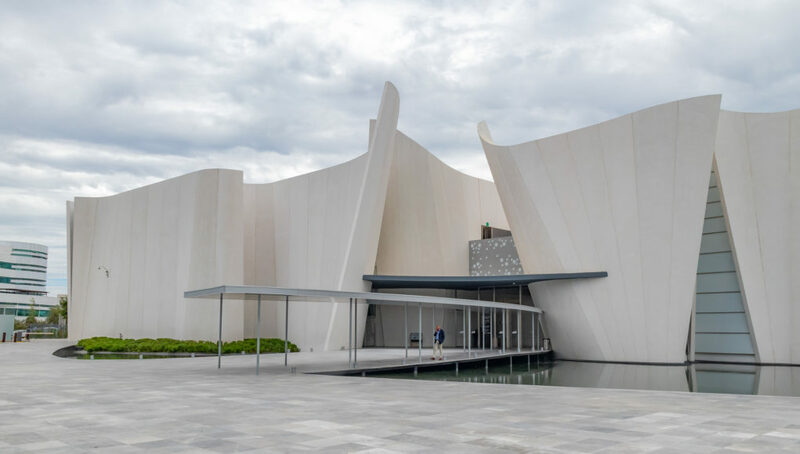 In 2017, the Museo Internacional del Barocco opened in Puebla City, Mexico. The new building, designed by Toyo Ito, is worth seeing both for what’s inside and for how it looks on the outside. The permanent exhibit is spread through half-a-dozen rooms and focuses on architecture, literature, art, music, and theater. Combined, the different installations provide a comprehensive educational experience that will open your eyes to how much influence Baroque has had on our lives. The front entrance of the Museo International del Barroco. The front of the Museo Internacional del Barroco reflected in its moat. A convergence of lines in the interior of the Museo Internacional del Barroco. The main staircase inside the Museo Internacional del Barroco. An interior shot of the Museo Internacional del Barroco. Sharp angles and contrasting finishes on the exterior of the Museo Internacional del Barroco. A patio on the rear of the Museo Internacional del Barroco. At the rear of the Museo Internacional del Barroco, the groomed flora of the Ecoparque Metropolitana provides a comforting green space.